The sun reaches the winter solstice at 11:11 a.m. CST on December 21. At this time it makes its lowest arc across the sky as it reaches its southern most rising and setting points. It is in the sky 9 hours, 9 minutes in the Chicago area reaching an altitude of 25 degrees above the southern horizon at noon. At the time of this writing Comet ISON is a characteristically dim comet visible only with the aid of a binocular or small telescope. Should it grow to naked eye visibility, updates will occur in future postings. Venus sparkles in the southwest after sunset. It is the brightest starlike object in the sky. After it reaches its greatest brightness during this evening appearance on December 6, it rapidly closes in on the sun. By month’s end, it disappears into the sun’s brilliance before it moves between the Earth and Sun (inferior conjunction) on January 11, 2014 moving into the morning sky. Through a small telescope or binocular, if held steady, Venus appears as a crescent, resembling the moon. As the month progresses, Venus appears larger and thinner. 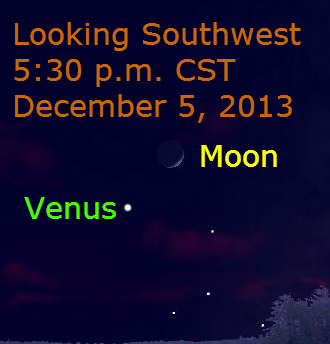 On December 5, the waxing crescent moon appears about 7 degrees to the upper right of Venus. Jupiter appears low in the eastern sky as Venus sets in the west. It appears in front of the stars of Gemini (Castor and Pollux). At mid-month, Jupiter rises in the East-northeast at 6 p.m.
On the evening of December 18, the moon appears about 5 degrees to the lower right of the moon. 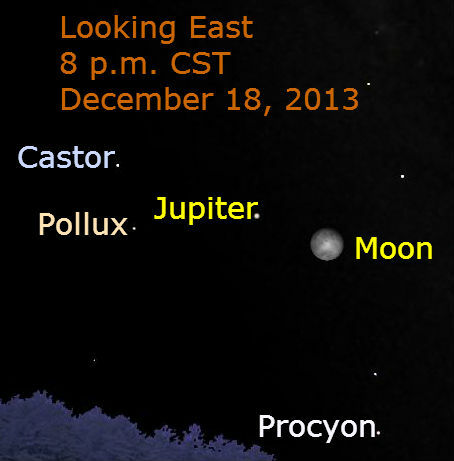 During the night Jupiter appears to move westward as great celestial sphere seems to rotate. 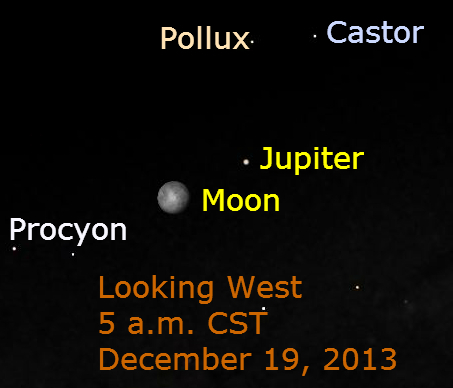 By the morning of December 19, Jupiter, the moon and Gemini appear in the western sky as shown in the chart above. 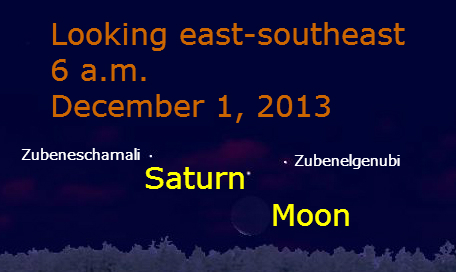 Early in the month, Saturn appears with the crescent moon during morning twilight. The stars Zubeneschamali and Zubenelgenubi, the brighter stars of dim Libra appear nearby. The names are translated as the “Northern Claw” and the “Southern Claw,” respectively, to show their former association with the constellation Scorpius. Near month’s end, the moon returns to the same region of the sky. 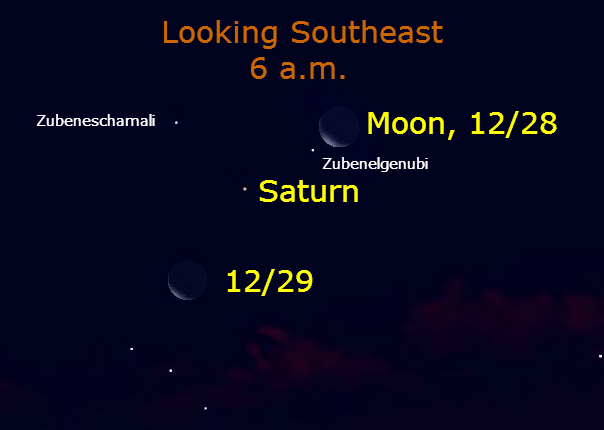 On the mornings of December 28 and 29, the moon passes the two “claw stars” and Saturn. On December 28, the moon is 7 degrees to the upper right of Saturn. The next morning the moon is the same distance to the lower left of Saturn. Meanwhile, Mars races across the sky from the region near Denebola (Leo) toward Spica (Virgo). Currently, its brightness is unremarkable, but it is easy to locate and watch as it moves eastward. 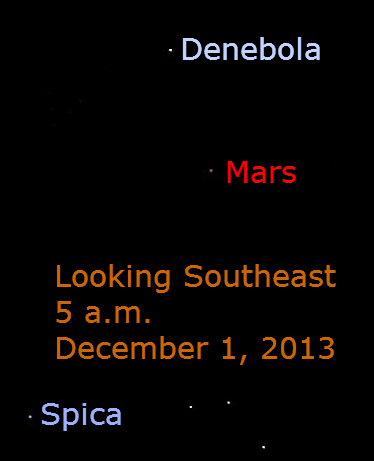 This chart shows the relative position of Spica, Mars, and Denebola on December 1st. On this date Mars is 27 degrees to the upper right of Spica. On December 25 and 26, the moon passes through the region to make the identification of Mars easier. 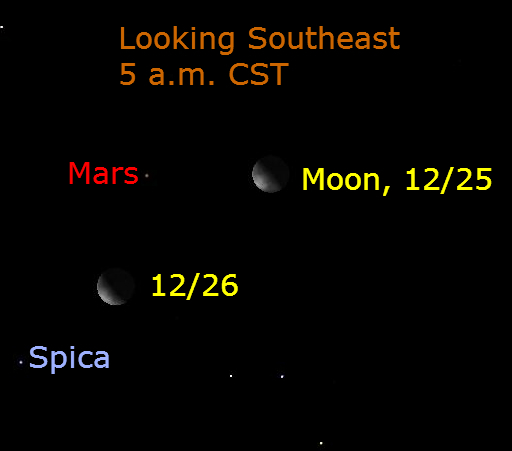 On the 26th, Mars is 15 degrees to the upper right of Spica. From the first of the month, it’s moved 12 degrees eastward, that equal to about 24 full moon diameters. This movement is what distinguishes the worlds of our solar system from the seemingly consistent pattern of the stars. 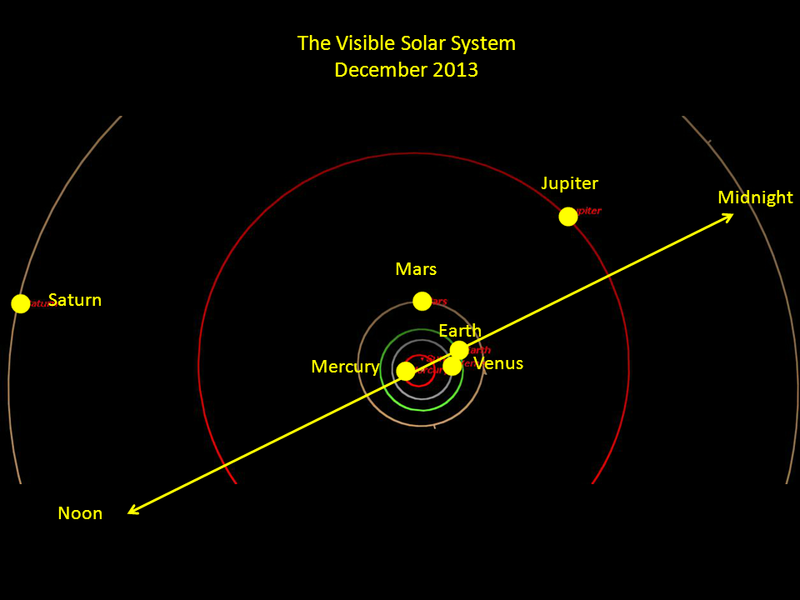 The chart above shows the planets on December 15, 2013 as if seen from above the solar system. With Mercury nearly behind the sun and Venus near Earth and in the evening sky, the other planets are on the morning side of Earth. Venus is the planet that gets closest to Earth. Because of the planet’s proximity and its clouds’ high reflectivity, Venus shines brightly in our evening sky.